Deliver this amazing gift of Ideal Emporium Delight English Breakfast Gift Hamper to deliver happiness into the lives of the people you love. 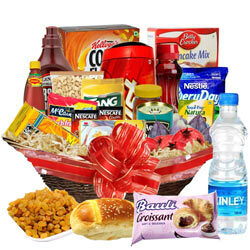 We have chosen a selection of rich flavors in this Hamper which include 1 Bottle of Hersheys Syrup - Chocolate (623 gr. ), 1 Can of Baked Beans, 1 Carton of Kelloggs Corn Flakes - Mango (300 gr. ), 1 Pouch of Nestle Dairy Whitener - Every Day (200 gr. ), 2 Pouch of Nescafe, 1 Corrisant - Swiss Roll, 1 Amul Bread Spread � Lite (100 gr. ), 1 American Garden Pan Cake Syrup 355 ml., 1 Jar of Dabur Honey (250 gr. ), 1 Tang Instant Drink Mix - Mango Flavor (500 gr. ), 1 Bottle of Kinley Mineral Water (500 ml. ), 1 Boost Health Drink - Malt Based (200 gr. ), Pomegranate (1 kg. ), Figs (1/2 kg. ), Cashew (250 gr. ), Raisins (250 gr. ), 1 Loaf of Sweet Bun, 1 Rusk It, 1 Sugar free, 1 Maggie Sauce (500 gr. ), 1 Pan Cake Mix from Betty Croker (500 gr.) and 1 Pouch of McCain French Fries (450 gr. ).